Philips launches GoGear Muse 3 portable player with 'swipe' sound control | What Hi-Fi? 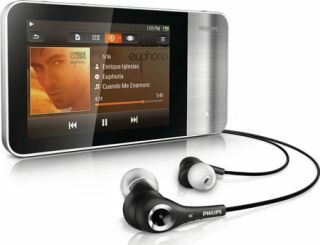 New from Philips is the GoGear Muse 3 portable music and video player with built-in FM radio. It comes with a 3.2in, 16:9 screen and uses Philips's 'Sound Personalisation' technology. This allows the user to adjust the sound by running their fingers around the four corners of the screen, which are marked 'powerful, warm, sparkling and vocal', selecting the type of sound they prefer. And Philips's 'Full Sound' feature uses a powerful processor and special algorithm "to enhance the quality of compressed MP3 files to make them sound more like the original recording", we're told. The Muse 3 also includes SafeSound, which constantly analyses the volume level and alerts the listener if it's too loud and could affect their long-term hearing. As well as supporting audio formats such as FLAC, MP3, WMA, AAC, Ogg Vorbis and WAV, it also handles video formats including MP4, WMV9 and RMVB. The Philips GoGear Muse is available now in 8GB and 16GB sizes, priced at £110 and £140 respectively.